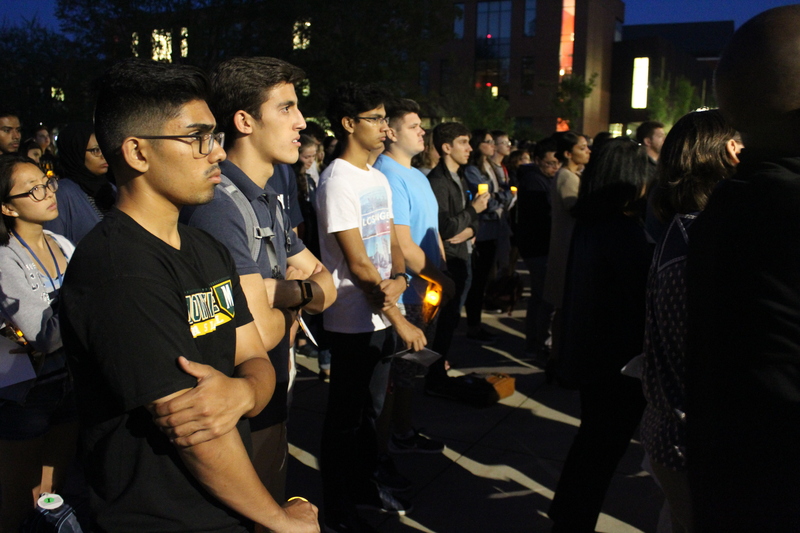 Several hundred University of Connecticut faculty and students expressed solidarity with victims of oppression and showed commitment to diversity during a candlelight vigil outside of the Student Union Wednesday evening. Many university faculty organized the “Candlelight Vigil for Memory and Justice” primarily in response to the “Unite the Right” white nationalist rally in Charlottesville, Virginia on August 11th. The speakers ranged from professors to undergraduates who voiced concerns about waves of hatred spreading throughout the country, but emphasized love, tolerance, and acceptance as the best counterstrategies. Several hundred students and faculty members attended the candlelight vigil hosted outside of the Student Union Wednesday evening. White supremacists, white nationalists, neo-Confederates, neo-Nazis, and various militias had organized Charlottesville protests to oppose the removal of a statue of Confederate general Robert E. Lee from Emancipation Park. The city council had also renamed it from ”Lee Park” two months earlier. Some of the marchers chanted racist and antisemitic slurs, carried semi-automatic rifles, swastikas, Confederate battle flags, anti-Muslim and antisemitic banners, and “Trump/Pence” signs. Clashes broke out between protesters and counter-protesters, leaving 14 injured, and 20-year-old Ohio native James Alex Fields Jr. drove his car through a crowd of counter-protesters, leaving one dead and 19 injured. Puerto Rican/Latin American Cultural Center Director Fany Hannon says she is deeply disturbed by the aftermath of the Charlottesville rally. “I don’t want to say I’m in denial, but I refuse to live in a nation [where] we are embracing hate. It makes me very scared to know that we can go backward instead of going forward…” Hannon said. One student says that President Donald Trump’s reaction to the violence in Charlottesville was insufficient. “I thought that the Trump administration had a very weak response to what happened in Charlottesville, and by the time the president corrected his first statement, in my mind, it was too little, too late… you really do have to call evil by its name,” Lucas Bladen, a fifth-semester undergraduate, says. Professor Glenn Mitoma says the turmoil in Virginia caused university staff to worry about the start of the semester, and they arranged the vigil in order to reassure all returning members of UConn’s commitment to safety. “It’s our effort to show UConn is a united community standing up for diversity, standing up for civility, standing up for democracy, and standing up for justice,” Mitoma says. Assistant Professor Joseph Cooper also mentions the importance of uniting via common values. “It is important for all of us to be reflective and steadfast in our commitment to sharing positive energy and supporting and uplifting one another,” Cooper says. While much of the evening’s dialogue focused on unison, some parts shed light on existing divisions. 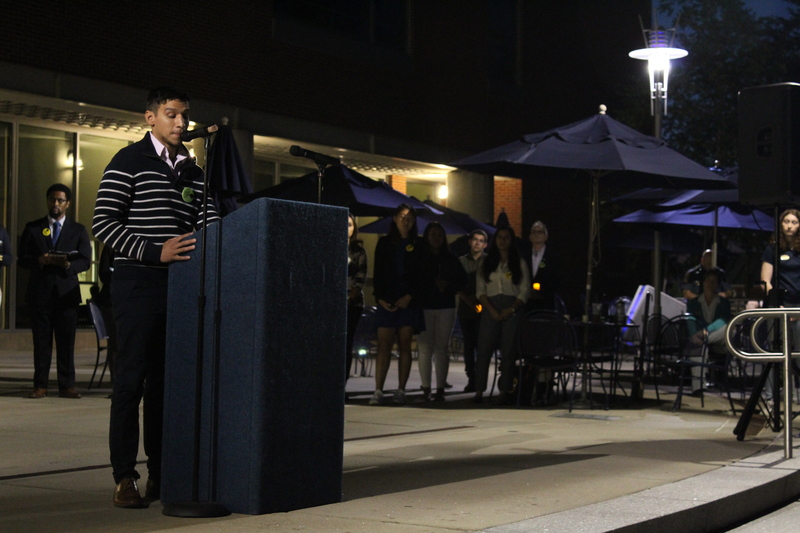 Caesar Valentin, co-coordinator of the Latinx Student Leadership Council, describes what he believes is a negative side-effect of UConn’s ever-increasing diversity. Caesar Valentin, co-coordinator of the Latinx Student Leadership Council, says he thinks that the university as a whole must do more to unite the different cultural groups on campus. Mitoma also says he recognizes a divide within the school community. “I think there’s a lot of work to be done. We want to project a sense of solidarity and togetherness, but we know there are divisions on our campus like there are divisions in our country,” he says. Discussing the greater significance of the vigil, third-semester student Sean says he thinks it should serve as a call to action for Americans to speak against hateful ideologies. Associate Vice President Eleanor Daugherty points to higher education as the key factor in students’ self-development and encouraged those attending the event to remember it fondly. “Higher education is a home, is a haven for intellectual discourse, because we know that growth and knowledge are attained only when we expose ourselves to new ideas, demonstrate open-mindedness, and expand beyond our previous understandings of the world…” Daugherty says. “Look around you. Remember these faces. Remember this campus. Remember the love that brings us here and live in that spirit. We are and will always be one UConn. Editor’s Note: Sean’s last name is not provided for confidentiality purposes. Daniela Doncel, Isaiah Chisolm, and Kyle Adams contributed reporting.